Magi sales are less than the usual huh? Sigh... The manga has lost it's flare. I just hope an anime can bring it back to it's former glory. Yeah seriously. I guess maybe they are waiting for the manga to end. The fact that Nozaki, Magi and Silver Spoon outsold Attack on Titan and none of them are getting another season is outraging to me. Sales dont equal squels idk why this idea is still around. I meant this week, not overall sells. I mean it would only be logical to adapt a successful manga which has higher request from the public. Gekkan Shoujo Nozaki-kun's sales pleases me. I hope it gets second season as well. I hope Golden Kamuy will continue its successes like this. I'm so happy for Gekkan Shoujo Nozaki-kun and Kakegurui. Glad to see that Japan at least has some good taste. Hoping to buy some Kakegurui manga volumes too. I really wish Gekkan Shoujo Nozaki-kun would get a second season. It's one of the few anime that genuinely made me laugh out loud multiple times. Even if there's only 9 volumes I'm sure there's enough material at this point to do another season. The fact that Gekkan Shoujo is selling so well, is unfortunately also a fact that there will be no second season. For most adaptation cases, you're not wrong. However, the sales for the anime was really good (around 10K average per volume), so a second season doesn't need to exist solely to boost manga sales. It has a monthly serialization, with each chapter being 14-15 pages long. Glad to see this on the list. Can. We. Please. Get. 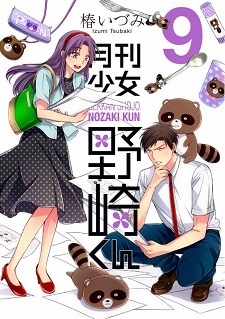 Nozaki. Season. Two. I'll hold out hope, there have been several shows lately that got sequels after many years, so hopefully Nozaki can be one of them.....hopefully. Doga Kobo no longer makes good anime, truly depressing.